NOTE: All pricing generated via our Online Price Calculator is not final. It's used to give you a rough idea on the cost from destination to destination. Most of the time it will be same, but if you would like a final price please use our online booking form or contact us. All pickups at International Terminal of Melbourne Airport attract $10 surcharge. Between 12.00 am - 5.00 am a night surcharge of $15 per booking is applicable..
Baby Seats, Booster Seats are charged at $10 per item for every journey. Trailers are charged at $15 per item for every journey. All stops during a journey will be charged at $10. All Card Payments attract 10% Bank Service Fee in Australia. 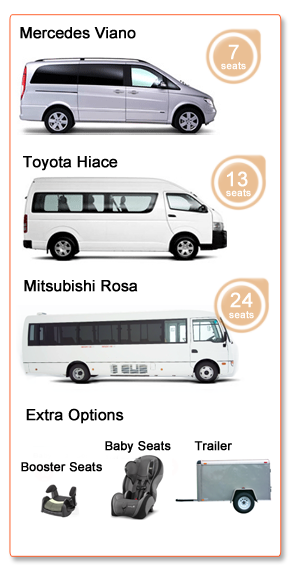 Travel in Style & comfort or get in touch. Copyright © 2019 Sky Vans and Bus Hire. All Rights Reserved.